Welcome to Grand View Resort, a peaceful resort setting in Sevierville TN with fast easy access to either downtown Sevierville or action packed Pigeon Forge. Guest staying in one of the resort's Sevierville cabin rentals can enjoy seasonal swimming pool access. Sevierville and Pigeon Forge attractions are plentiful, several rides, stage performances, outlet stores, and antique shops are only 5-10 miles from your resort cabin. Looking for a thrill ride, how about riding the Wahoo Zipline, actually located in Grand View Resort. As a guest of our Sevierville TN cabin rental, you're entitled to purchase discount tickets to ride the Wahoo Zipline or Wahoo Glass Bottom Boat (boat ride is across from the Smoky Mountain Knife Works and Museum). Traveling with a pet, Cabins USA has several Pigeon Forge pet friendly cabins for your entire family to enjoy. Check out our Smoky Mountains Area Information pages for valuable ideas on what to do while in the Tennessee Smokies! 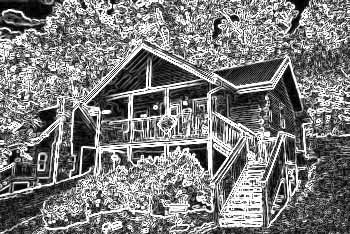 Book your Sevierville cabin rentals online with Cabins USA for immediate Online Cabin Discounts!